I have this circle of mommy friends that I met last year at my daughter's school. We would hang out after sending our kids to their classroom, talk about things like preparing snack or baon, doing homework and stuff until it's time to pick up our preschoolers and go home. 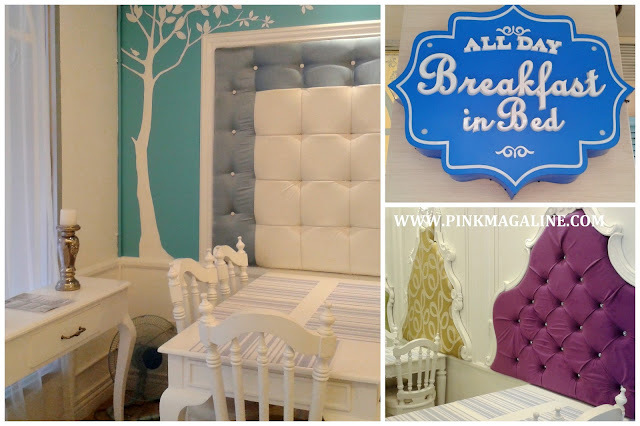 The other day, one of the mommy friends gave us a breakfast treat at the newly-opened All Day Breakfast in Bed in California Garden Square, Mandaluyong. She is celebrating her birthday today but did the little party in advance to give way to everyone's busy schedule. All Day Breakfast in Bed is a posh mini restaurant with a neat combination of classic and modern interior, lovely headboard as an accent to each table, white dining sets and all. 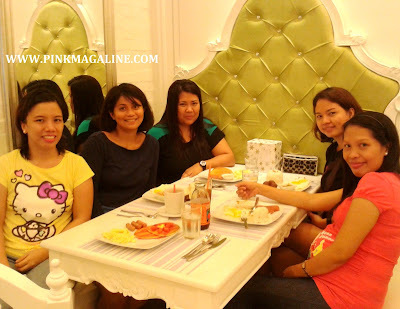 L to R: Gel, Joanna, Madz, Arlene (the bday celebrant), and I. It was a rainy so we decided to dine in All Day Breakfast in Bed instead of going to either McDonald's or Jollibee along Boni Avenue. My order was this Spam rice meal for P108. 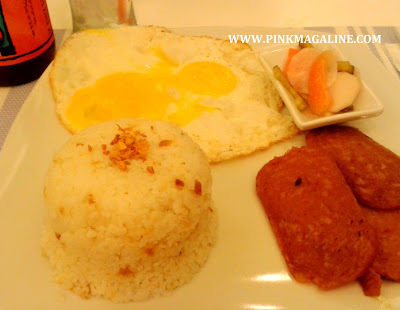 It has 2 sunny side up eggs, 3 thin slices of Spam luncheon meat, garlic rice, and pickled vegetables on the side. Arlene's order was this longanisa (native sausage) rice meal, one of their best-sellers, for P108. 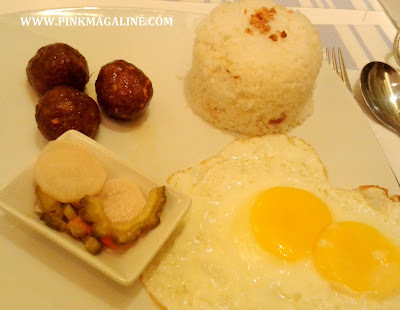 It comes with 2 eggs, garlic rice, and pickles too. 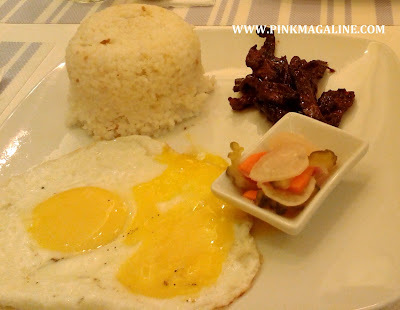 This tapa (Filpino version of beef jerky) rice meal is for P118. Joanne ordered this for herself. It includes the default 2 pieces of eggs, pickled veggies, and garlic rice. Madz asked for this basic pancakes served with scrambled eggs. 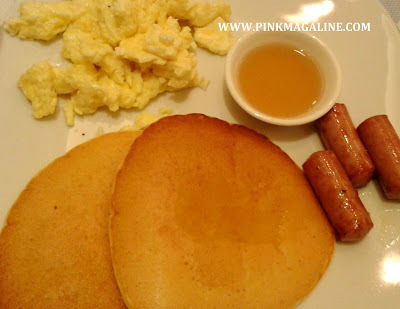 Basic pancakes is for P98, plus 3 sausages with an additional charge of P30. 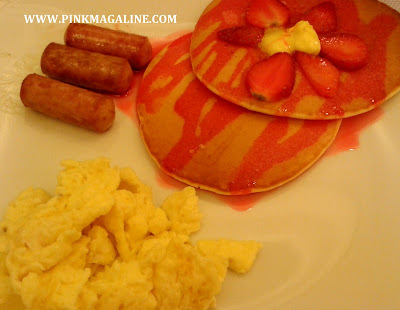 Gel's order: strawberry pancakes with scrambled eggs P108 + P30 for 3 sausages. I was supposed to order this but changed my mind. Mi amigas by the door of All Day Breakfast in Bed, all smiles after the breakfast treat and getting ready to pick the kids. -The ambiance of the place is excellent. I love the breakfast in bed theme. -Server was polite as well as the manager. -Their longanisa or sausage was meaty and contained less fat. -Garlic rice was not oily. -The pickled vegetable was too sweet for me. -Since its a breakfast restaurant, I think it would be better if they add fresh milk and fruit juices to the menu. -Aside from garlic rice, there should be a choice of plain or steamed rice. -Instead of serving 3 thin slices of Spam, make it 2 but thicker. Will I dine at All Day Breakfast in Bed? Probably yes, if it's rainy and I'm feeling lazy to go somewhere else again. 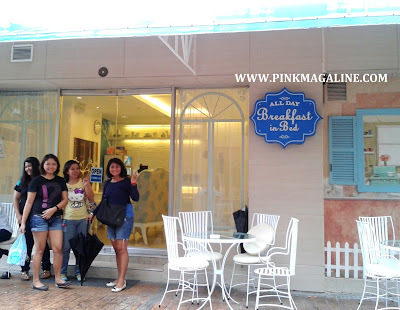 Ang ganda nung place and the concept/theme is very cute. Kaya lang parang ang liit nga ng serving nila ng ulam. Is it inside the California po ba or just outside,..everyday kasi me nadadaan sa california, but hindi ko po napapansin yan..hihihi.. or sadyang dedmadela lang me lagi. The place looks comfy and the princess-like feel is so apt! Will bring my girls there! Will probably try it out when I get back. Looks nice naman ng ambiance. wow, unique concept for a breakfast place. sis berylle is right, it would have been ultra comfy if the seats were actual beds. haha! sometimes it's always nice to eat somewhere different than the usual fastfoods. but the food seems to not match with their concept? heehe..